Posted by claralieu in drawing. I am pleased to announce an invitation to Wellesley College students for submissions to “Line by Line”, a student drawing exhibition from Nov. 3-29. Over the past year, all of the student exhibitions hosted by the gallery have been focused on a specific course, whereas this exhibition will encompass works by students from all different classes. Students who submit their drawings must consult with a studio art faculty member of their choice to select up to 3 works to submit. All students who submit are guaranteed 1 work in the show. Space permitting, students may have up to 3 works in the show. For information on how to submit your work, click here. 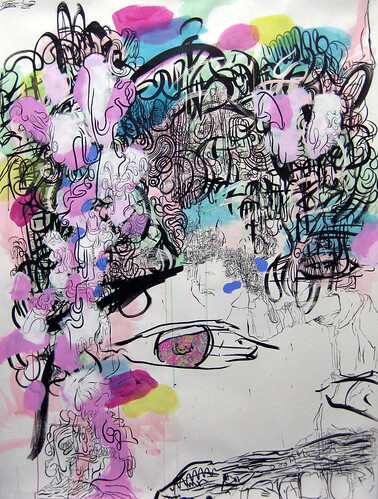 Posted by claralieu in drawing, Gallery Talks, photography, printmaking. This afternoon the gallery hosted a lunchtime gallery talk for “Pulp: Works on Paper by the Studio Art Faculty“. Wellesley College Book Arts Program Director Katherine McCanless Ruffin, and Professors Daniela Rivera and Christine Rogers presented short talks on their works in the exhibition. 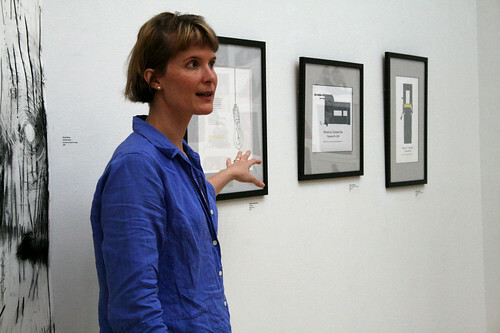 Katherine McCanless Ruffin discusses her letterpress prints. The two prints on the right are images of the a vandercook press, created from letter forms and punctuation. The print on the left was a collaborative piece which was recently completed with Kiki Smith through the Davis Museum. 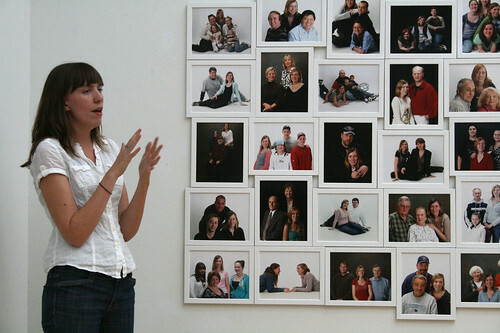 Christine Rogers discusses her photography project “New Family”. 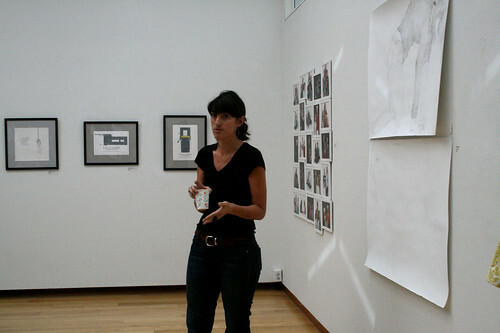 Daniela Rivera discusses her silverpoint drawing. A preview of a work that will be in “Pulp: Works on Paper by the Studio Art Faculty“: “Range XIV”, an ink drawing of mine from the “Waiting Series”. Read my artist statement below the image. These ink drawings are from the Waiting Series, a body of works which explored social isolation in the context of lines of figures waiting in an undefined space. I was interested in the contradiction of the act of waiting: waiting figures stand in very close physical proximity to each other, but at the same time are locked within themselves, unaware and unresponsive to the other figures surrounding them. 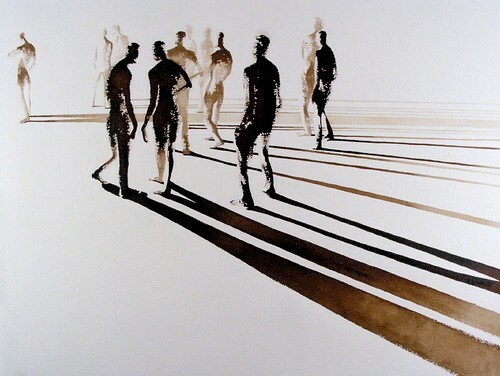 Despite their isolation from each other, a line of waiting figures creates a situation where the gesture of one figure directly leads to the next, creating a fluidity and visual relationship between all of the figures. I began this project with the construction of about 100 small scale figure sculptures to serve as reference models for ink drawings, prints, and paintings. Each figure was sculpted to represent a unique gesture associated with waiting. The figures were purposefully sculpted with very little detail, so that their ambiguity could stimulate more visual possibilities when transitioning to other media. The casting process provided the opportunity to replicate each individual figure in large quantities, allowing for repetition of the same figure throughout various compositions. I developed a strong familiarity with these recurring figures, recognizing them in different contexts with each new composition. 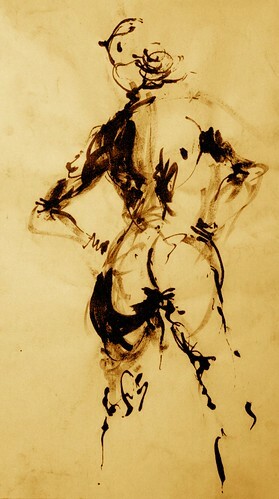 Posted by claralieu in artists, drawing, painting. I’m in the process of collecting images and information from the faculty in “Pulp: Works on Paper by the Studio Art Faculty” this week. Below is a preview of one of the works that will be in the show: “Madd”, an drawing with ink, watercolor, and acrylic paint on Fabriano paper by David Teng Olsen. I’ve included an excerpt from his artist statement where he talks about his creative process and engagement with drawing and his materials.